AN EFFICIENT power supply system is a key requirement for a nation’s economic growth and the quality of life of its citizens. This is because the power system facilitates commerce trade and industry. While Zambia has been making strides in increasing power generation through the expansion of existing power stations and establishment of green field projects, the country still has to import electrical equipment to facilitate power transmission and distribution, which comes at a high cost compared to what it would have cost if the equipment is manufactured locally. The absence of an electrical equipment manufacturing base has thus created a vacuum that needs to be filled if the country is to enjoy reliable supply, which will push the economy forward. However, there is hope, following the proposed establishment of an electrical manufacturing equipment plant at the Lusaka South Multi Facility Zone. The company, Afrizam Electrical Equipment Limited, which has partnered with China-based Company, Rongzhong Electrical Equipment Limited, with an initial investment of US$15 million, plans to manufacture power transformers, switch gears, mini substations, among other electrical equipment. The construction of the plant awaits Zambia Environmental Management Agency (ZEMA) approval. The partnership with Rongzhong Electrical Equipment Limited, which is one of the largest electrical manufacturing companies in China, producing 800 concrete electrical poles per day, between 20,000 and 30,000 high voltage switch gears annually, and between 800-1,000 transformers monthly is necessary for not only Afrizam Electrical Equipment Limited but the country as a whole because of the skills and technological transfer. Through the partnership with the company, which also produces transformer oil, it is envisioned that Afrizam Electrical Equipment Limited will replicate the sister company’s model thus contributing to the economic transformation of the country through industrialisation. Afrizam Electrical Equipment limited director Johnny Lin Guo explains that the company will in the first year of the project assemble 500 transformers annually. The manufacturing of the equipment will start in the second year, with 300 switch gears expected to be manufactured monthly. “Our goal is to manufacture everything from scratch but for starters, we will assemble the equipment from our sister company as we develop our plant. Phase one will be mainly to assemble transformers then start manufacturing transformers and switch gears of different sizes in the second phase,” he says. According to Mr Guo, the partnership is important because it will enable Afrizam Electrical Equipment Limited to enter into strategic partnerships with international companies such as ABB, Siemens, Schneider, DuPont and Gunter Seibold, a move that will put the company on the international market and position Zambia as an electrical manufacturing equipment hub. “We are eyeing the Common Market for Eastern and Southern Africa [COMESA], Southern Africa Development Community [SADC] and other regional markets so the partnership with Rongzhong Electrical Equipment Limited will enable us produce products that will be internationally accepted,” he says. Similarly, Rhogzhong Electrical Equipment Limited general manager Chen Shunping says the partnership will go a long way in boosting Zambia’s industrialisation potential through technological and skills transfer. 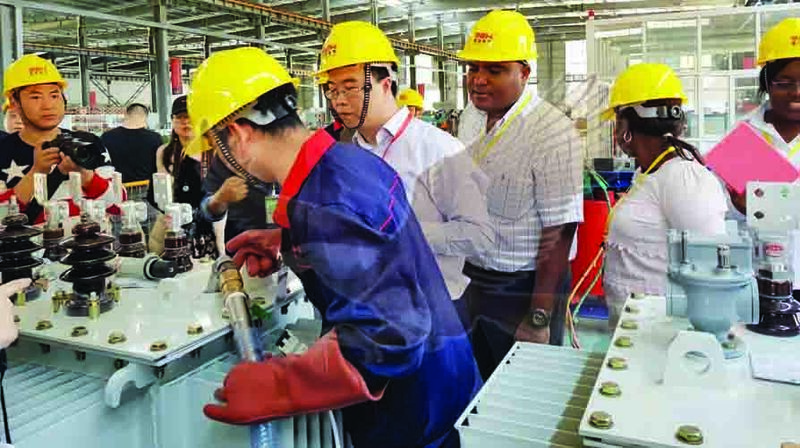 Speaking when a 16-man delegation visited the manufacturing plants in Quanzhou, China last week, Mr Shunping said through the partnership, the company will help position Zambia as an industrial hub for electrical equipment unlike currently where the country imports its equipment. The delegation comprised of counsellor at the Zambian Mission in China, Vincent Mwewa, officials from Ministries of Commerce, Trade and Industry, and Energy, Lusaka South Multi Facility Economic Zone, Zesco Limited, Copperbelt Energy Corporation, Rural Electrification Authority and Zambia Development Agency. Lusaka South Multi Facility Economic Zone managing director Mukela Lubasi is happy to host the manufacturing company at the economic zone saying apart from creating jobs, the company will accelerate industralisation. “This is a milestone especially that we have broken into a new market .We have not had investors from China in the zone since inception so the partnership between Afrizam and Rongzhong has set the pace to break into the Chinese market. “China being key in the global economy in view of its technological advancement, which has made its economy robust, so it is necessary for the zone and Zambia as a whole to attract investors from that country,” she says. For first republican Kenneth Kaunda, the development demonstrates the continued partnership between Zambia and China dating back in the late 1960s. Dr Kaunda, who is also Afrizam Electrical Equipment chairman said the co-operation is key in the economic transformation of Zambia and underpins the commitment he made with late People’s Republic of China leader chairman Mao Tse-tung to accelerate ties between the two countries. “The relation we share cuts across sectors including trade and infrastructure. Partnership between the Chinese and Zambian companies has increased and there is need to ensure that the partnerships result in high quality of what goods and services,” he said in a speech read for him by Afrizam Electrical Equipment Limited commercial director Musata Ndhlovu. With Government approving the new industrial policy, which has been designed to promote economic growth with support to companies that add value to local resources through a growth oriented policy framework, it is envisioned that companies such as Afrizam Electrical Equipment Limited and other companies will soar and help Zambia attain industrialisation through partnerships with investors that will bring on board the much needed skills and technological transfer.